1- The trick is to peel the pears but leave the stem intact. You can do this with a small paring knife, or with a peeler. It's easiest to start just below the stem and work around the pear, working in circles gradually toward the bottom. 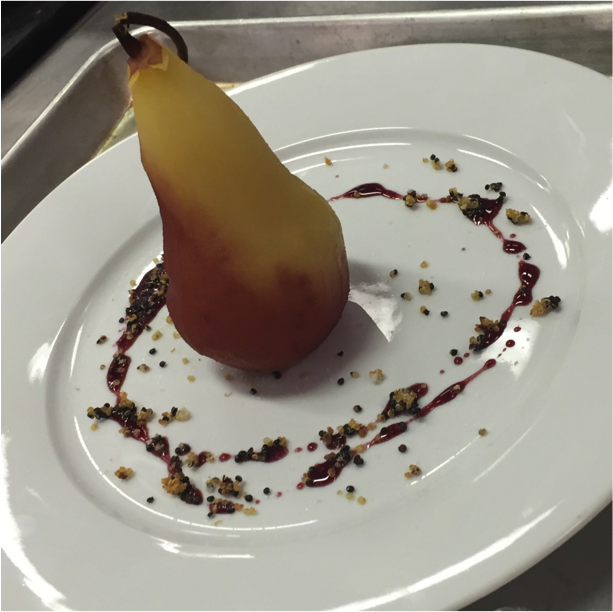 2- If you want to get fancy, you can also use a paring knife to make a cone-shaped cut out of the bottom of the pear. This should remove most of the core, but the pear should still be able to stand upright and it should still look whole. 3- After doing this, carefully place the pears in a medium sized pot. Add the pomegranate juice, lemon halves, ginger, cinnamon, black peppercorns, vanilla extract, and sugar. Pour enough water on top of the pears so they are covered with liquid. Place a small plate on top of the pears to keep them submerged. 4- Simmer the pears for about 20-25 minutes, until they are tender but not mushy and not falling apart. You can test them by stabbing a paring knife through the bottom of the pear, it should slide in and out easily. 5- Turn off the heat but leave the pears in the liquid. Allow them to cool in the liquid, and refrigerate the whole pot for 2 hours or up to overnight. 6- Take the pears out of the liquid carefully with a slotted spoon. Stand up a cold pear on a dessert plate, and sprinkle with the chopped dried persimmons. Chef's Tip: After serving the pears, try straining the poaching liquid and mixing it with bourbon or rum for a warming winter cocktail.